Following his promise of 4% economic growth, President Donald Trump’s first scorecard could fall well short. The advance estimate of first-quarter gross domestic product — which measures the value of everything Americans create and do — is expected on April 28. 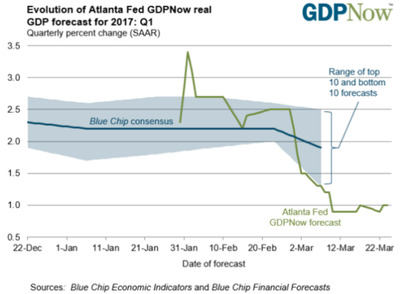 And based on data from January through March that’s already available, the GDP reading could be weaker than expected. Importantly, consumer spending, which is the biggest part of the economy, is tracking lower. On Friday, data from the Department of Commerce showed that real personal spending, adjusted for inflation, fell by 0.1% in February and by 0.2% in January. The drop in February was mostly because of a slump in spending on utilities, particularly on heating, as the month set a new heat record. Data for March is not yet available. 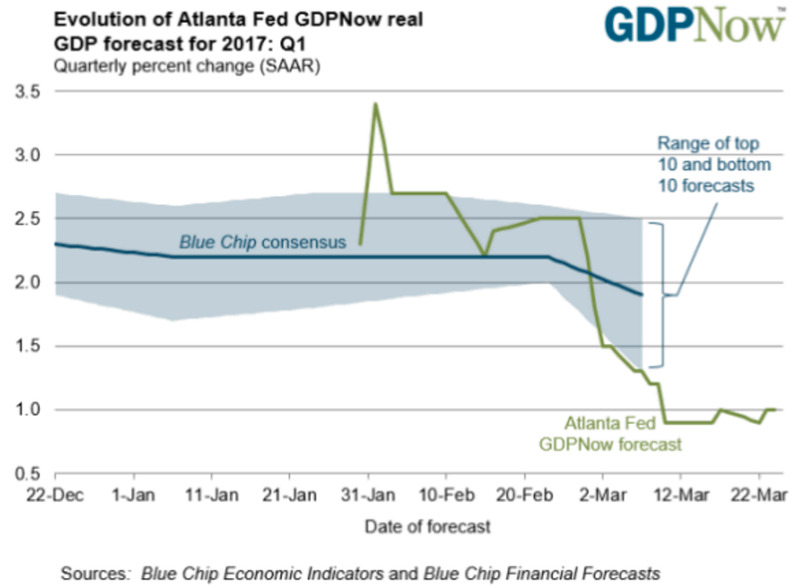 The Atlanta Fed’s GDPNow tracker estimated first-quarter growth at 0.9%, down from its prior forecast of 1%, on the expectation that consumer spending would slow. The tracker has fallen from as high as 3% in February as hard data on spending and production rolled in over the months. There are a few necessary caveats: GDP revisions will be published twice more in the second quarter and once again next July, so the data would not be final. This happens for every quarter’s data, but Q1 can be quite notorious because winter can complicate the government’s seasonal adjustments. Also, delays on tax returns may have depressed spending in February, according to Gus Faucher, PNC’s deputy chief economist. Also, Federal Reserve Chair Janet Yellen has characterised GDP as a “noisy” indicator, and said one quarter’s print should be considered in the context of other so-called “hard data” like employment and manufacturing numbers. But what holds is the conversation about whether Trump’s campaign promise of returning the economy to growth above 4% — later cited at 3% — is a feasible target. Several economists and policy nerds do not think so. Federal Reserve officials think the economy, at its best, will grow at an annual rate of 2.4% through 2019. The nonpartisan Congressional Budget Office projects less than 2.5% growth on average until that year.